During the residency, each artist established a unique studio practice, based in different buildings in the sanctuary but extending into the beautiful natural surroundings. H. E. Ramage arranged a painting studio space in the upper floor of the hundred-year-old carriage house at Lacawac. This barn-loft style space was close to nature, complete with other small furry and crawling inhabitants sharing the space. The feature loved most by the artist were huge sliding doors on both floors of the barn to let in the light, rain, smells, energy, and sometimes birds, of the mountain forests! Works in progress in the carriage-house-turned-studio of H. E. Ramage from the Lacawac Fall 2018 artist’s residency. Daily exploration of the surrounding forest trails and mountain lakes gave insight into the unique flora and fauna of the Poconos area. Growing and then decaying clusters of mushrooms, local populations of bright orange spotted newts, and all manner of crawling, flying, swimming, frolicking, and growing things. The Lacawac area teems with life, and taping into that ecosystem was an inspiration for all the residents! This fall, four female artists came together in the Northern Poconos on the shores of Lake Wallenpaupack, at Lacawac Sanctuary and Biological Field Station. Lacawac is a nature center, environmental education facility, ecological research station and historic venue, and for fifty years has welcomed all ages for the opportunity to learn, study, and create. Though initial geography may impart a sense of isolation, this area of the Northern Poconos is a wealth of life and cultural discovery. On one afternoon, artists Geri Gray and H. E. Ramage stumbled onto the land of local nature artist Larry Doda. Extensive ecosystem-supporting gardens, balanced cairns made from stones collected from the ruins of centuries-old structures, and trails through a beloved cypress-filled bog number among the creations of this solitary but memorable artist. SCAD B.F.A painting seniors H. E. Ramage and Zander Stefani make themselves known as emerging artists of the industry tonight at Non-Fiction Gallery in Savannah, GA.
Non-Fiction Gallery is transformed into a sculptural “wonderland” with an interactive installation and a room full of free-standing sculptures. Blue thread weaves between walls, ceiling, and artwork, interconnecting the gallery, the different bodies of work, and the viewers. Gallery-goers enthusiastically add to the web, spinning thread around sculptures and friends alike! Greetings from Wonderland exhibits a salon-style wall of small work, large-format paintings, and free-standing sculptures. Throughout the gallery, work by Ramage and Stefani is intermingled, suggesting playful new interpretations in the contrast of styles. Tonight, We Step Into Wonderland! Savannah, GA, May 19th, 2017- Non-Fiction Gallery, a program of Art Rise Savannah, is pleased to announce the opening of Greetings from Wonderland, a two-person exhibition by H. E. Ramage and Zander Stefani. The opening reception is Friday, May 19th from 6 – 9 pm. Non-Fiction Gallery is located at 1522 Bull St, Savannah, GA, and the event is free and open to the public. Come to the ALEXANDER COLLECTIVE SALON 2017! An open exhibition of student work, this Salon is an annual event by the student-run club of the painting department, the Alexander Collective! Post a photo of your favorite work from the show on Instagram with #ACSALONVOTE2017 to place your vote for the Popular Choice Award! A panel of juries will also award the Best in Show, and the award winners will be announced at 8 pm. Students were able to go on a 3 day excursion to New York City this past weekend on a SCAD-sponsored event to visit Frieze New York 2016 and NADA New York 2016, among other artistic events. The cultural education and international industry networking received by these Graduate and Undergraduate Painting students will their work and careers as they proceed towards graduation. Pictured is SCAD painting undergraduate student Hannah Breshears with a painting by Donna Huanca of the Peres Projects, Berlin at the Frieze Art Fair in New York City. Students were able to see work by acclaimed artists such as Mickalene Thomas, Lisa Yuskavage, and SCAD alum Summer Wheat at the Friezr and Nada art fairs this weekend. Hannah Breshears will have work exhibited in the showcase, and her painting studio will also be open to visitors for a look into the artist's process as well as exhibiting more work. 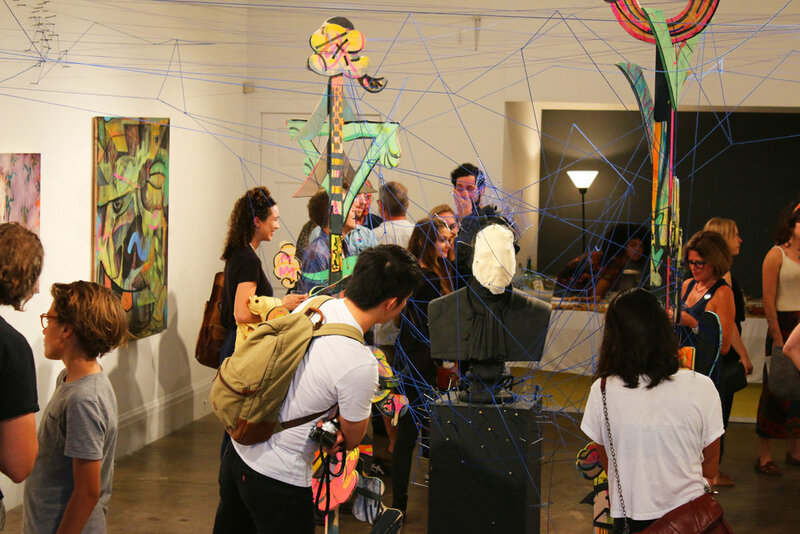 The SCAD deFINE Art 2016 student showcase features the best of original SCAD student artwork. Graduate student painting studios will be open to visitors, and select works will be displayed throughout the halls. All artwork is available for purchase. Presented as part of SCAD deFINE ART 2016, which takes place Tuesday, Feb. 16 through Friday, Feb. 19, 2016. All SCAD deFINE ART lectures, receptions and events are free and open to the public. Student Showcase at SCAD Lacoste, exhibiting the work they made throughout the Fall quarter in this wonderful village of Provence. Hannah Breshears, Sean Taillefer, and other students walking in the procession, carrying the painting, and playing music. During a quarter spent studying abroad in the fall in Provence, students and villagers alike were impressed by Rex Hausmann's gifts of vitality and inspiration. The color he brought to the small town of Lacoste, France, culminated in a city-wide parade in which we carried his massive, tapestried painting from the base of the hill to the crown. Styled after a traditional French Processional, the painting was suspended from hand-made poles. Beginning at La Lavuar, students made handprints on the back of the piece using red ochre from the mines at Rousillon and cleansed their hands in the ancient bathing pools there. Music was played, and the troupe carried the painting through the town. Baguettes, merriment, and companionship followed, and the impressions made on the town built a stronger bond between friends of different countries. Hannah Breshears signs her name after making a handprint- a signature method chosen by Rex Hausmann because of its origins in ancient artwork. There are few pieces in an artist's life that have the ability to impact and influence an entire community. There are even fewer times when the artist has the ability to impact an entire village in the Provencal Valley of the Luberon in southeastern France, and make them a part of the work itself. However, Rex Hausmann, a graduate painting student at the Savannah College of Art and Design bridged the gap between American student and villager. His piece, The Cathedrals of Lacoste, incorporates not only the present impact that the village of Lacoste has had on him, but is also representative of the lasting impression he hopes to have on the village. Left: H. E. Ramage signs her name after making a handprint- a signature method chosen by Rex Hausmann because of its origins in ancient local artwork. Washing of hands dyes the lavour beautiful red. A vantage point in the boulangerie-turned-library from which to watch the processional. Front view of Rex Hausmann's painting, carried by Wai Pong Tong and Sean Taillefer. Very nice moment spent with Wendy White who gave us a tour of her "skiing" paintings in Jérôme Pauchant's art gallery. One of many great excursions during our 5-day trip to Paris, France! A campus-wide interdisciplinary critique gave students access to feedback from peers and professors of every major, as well as a chance to present their work. Participating students included Hannah Breshears, Kristen Phipps, Sua Han, and Jacki DeSantis. Hannah Breshears was featured on the cover of the first edition of "Le Scribe," Lacoste's weekly publication. She and classmates were sketching and painting plein air on the first day of classes at Savannah College of Art and Design's Lacoste campus. Prof. Knudsen with student Hannah Breshears, Kristen Phipps, and Sandy Owens capturing Mont Ventoux as Picasso did years ago.